Located in Cabo San Lucas at the tip of Baja called Land's End, this beachfront resort offers a combination of attentive service and suite accommodations in a breathtaking setting of casual luxury. Surrounded by magnificent desert and set on the best beach, it is walking distance to the marina, shopping and nightlife. All suites are equipped with kitchenettes, satellite TV and deluxe amenities. 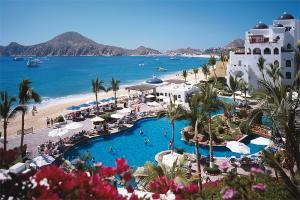 Located in Cabo San Lucas at the tip of the Baja Peninsula nestled on the only swimming beach in Cabo San Lucas Bay. Las Palomas serves a unique variety of Mexican and International cuisine in a climate-controlled, indoor setting, or our outdoor terrace. On Sundays, enjoy an extravagant brunch along with our special mimosa, freely poured. Cilantro's, on the ocean terrace, offers diners fresh fish and seafood specialties. The restaurant overlooks the beach and the bay to El Arco. Pool Bar, where you can enjoy a variety of drinks and snacks including some of the best sandwiches around, and In-Room Dining.